People across the United States and around the world will come together to celebrate the Lunar New Year, one of many winter holidays celebrated in America. 2017 is the Year of the Fire Rooster, which comes about once every 60 years in the cycle of the Chinese zodiac. The Rooster, known as an early riser, is considered a symbol of hard work and diligence. The holiday starts anytime from mid-January to mid-February, depending on the lunar calendar. This year, it begins January 28. The Lunar New Year is traditionally celebrated with red lanterns, parades, firecrackers and, as in many cultures, a special meal to ensure happiness and prosperity in the coming year. In China it is marked by a weeklong public holiday and mass travel by Chinese to their hometowns for family reunions. It also is a time for family members to exchange red envelopes filled with money to ensure a prosperous new year. New York City, which hosts the largest Chinese population outside of Asia, has made the celebration an official city holiday. Children will get time off from school to celebrate with their families. The Empire State Building (left) will be lit up in red and gold and there will be a fireworks display in Chinatown. There also will be a big parade February 5. Additionally, Chinese cultural organizations will be hosting concerts and dumpling-making parties. Since the mid-1800s, San Francisco has been home to a large Chinese-American population, and today it is home to more than half a million people of Chinese heritage. To celebrate the Year of the Rooster, San Francisco’s lion dancers perform at the city’s libraries with displays of martial arts, traditional instruments and the all-important lion costume. San Francisco will also host one of the biggest New Year’s parades in the world on February 11. 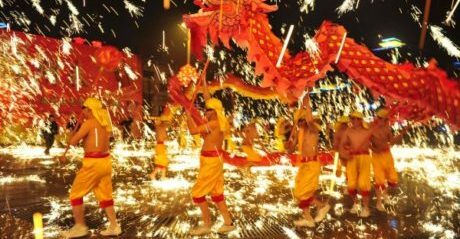 The Houston New Year celebration was named “best festival of 2016” last year for Chinese musical performances, egg rolls, martial arts exhibitions and more than 100 lions and dragons dancing amid firecrackers to exorcise evil spirits and to summon good luck. Houston is one of the more recent official celebrations in the United States. For years it was an unofficial holiday celebrated by the small community in Texas. However, over the past several years, as thousands of Asian Americans have come to Houston, the celebration has blossomed into a major event, drawing 40,000 people in 2016.